Location: Châlus, in the Haute-Vienne departement of France (Limousin Region). Notes: Château de Châlus-Chabrol (Occitan Limousin Chasteu of Chasluç Chabrol) in Chalus in Haute-Vienne (eleventh and seventeenth centuries), is built on the right bank of the Tardoire, on a rocky promontory overlooking the town of Chalus. It is known for his seat in 1199 led by Mercadier, in which Richard the Lion Heart was mortally wounded by a crossbow bolt fired by Pierre Basile. 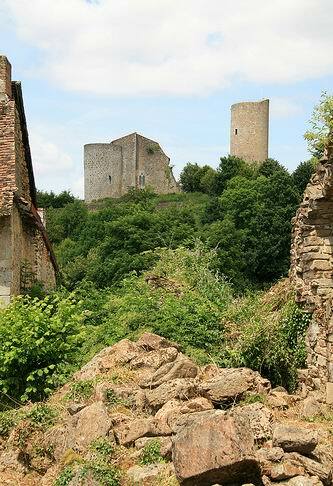 The castle of Chalus-Chabrol consists of an old main building, an adjoining corner tower and a dungeon, dating from the erection of the castle. They are complemented by a chapel in ruins, wells and a main building of the seventeenth century. The Chalus-Chabrol site listed since December 1944; By decree of 25 March 1981, the keep, the corner tower, facades and roofs of the main building adjoining the tower are classified as historical monuments while the facades and roofs of the main building of the seventeenth century are registered.